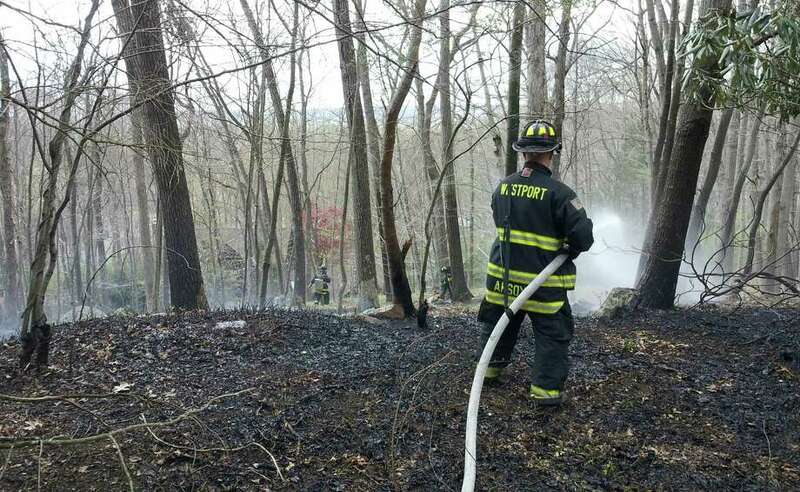 Westport firefighters extinguished a brush fire in the area of Butternut and Greenbrier lanes Sunday afternoon. No injuries or significant damage were reported. A brush fire in the vicinity of Butternut and Greenbrier lanes Sunday afternoon singed items left in a home's backyard before being extinguished by Westport firefighters. The fire was reported shortly after 1:30 p.m. Sunday, and when fire crews arrived on the scene, an area of approximately 100 square feet was in flames behind the house at 25 Greenbrier Lane. Additional firefighters were dispatched to Butternut Lane, which offered better access to the fast-moving fire, according to fire officials. A 5-inch supply hose was used to pump water from a hydrant on Bayberry Lane to the engine at the fire scene, requiring police to shut down traffic on Bayberry Lane for about an hour. A pool filter and bicycle in the rear of the house at 4 Butternut Lane were burned by the flames that advanced near the rear of the dwelling. No additional damage was reported and firefighters incurred no injuries battling the blaze. The fire was extinguished in 45 minutes. Cause was not immediately determined. Three engines with total personnel of nine firefighters were sent to the scene.